The Real Hero of Jammu, Major Ajay Singh Jasrotia, moved with the unit for 'Operation Vijay' as part of 56 mtn bde. the unit was tasked to capture pt 5140, which dominates the Srinagar-Leh Highway. Accordingly, an administrative base was sited at drass. on 15 june 1999, the location came under heavy enemy artillery shelling. The very first shell injured six or and sent across a wave of shock and panic among other who desperately ran for cover. 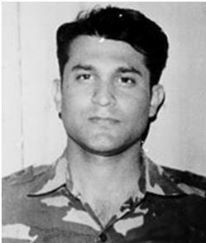 Major Ajay Singh Jasrotia, immediately sensed the gravity of the situation, took charge and ordered all the troops to take cover within the area of the adm base thereafter, instead of taking cover, he attended to the casualties inspite of the continuing artillery shelling and arranged for evacuation of the wounded to safety. He organised troops into suitable groups and along with them, carried the soldiers on his back amidst heavy artillery shelling which continued unabated. during the evacuation of the casualties, a shell landed in close vicinity of maj jasrotia, injuring him seriously. with total disregard to his injuries, Major Jasrotia continued with his task of evacuating the injured soldiers. this worsened his condition due to steady loss of blood, but inspite of persistent persuasions by the troops, Major Jasrotia refused to be evacuated even as life slowly ebbed out of him. he finally succumbed to his injuries, thus making the supreme sacrifice of his life, but not before he had sent six serious casualties to their safety, all of whom later survived. Major Ajay Singh Jasrotia awarded Sena Medal for his exceptional sacrifice during Kargil War. Manish Behl played the role of Major Ajay Singh Jasrotia in the Movie LOC directed by JP Dutta in 2003. Jai Hind! Omar Abdullah Sympthaize With Terrorist?